Students of German and French build and subsequently tear down a memorial recreation of the Berlin Wall under the leadership of Dr. Ute Lahaie Monday afternoon. 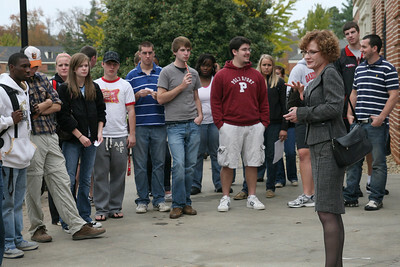 The event, which took place on the Quad behind the DCC, marked the 20th anniversary of the fall of the Wall on November 9, 1989. 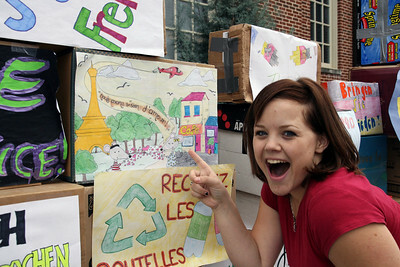 Tanika Lee shows off her French piece of the "Berlin Wall" she created as part of the commemoration of the fall of the Wall Monday afternoon. 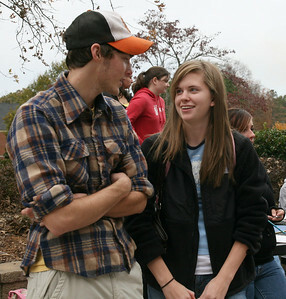 Brad Lail, senior, and Lauren Shirkey, sophomore, discuss the history of the Berlin Wall at the commemoration of the 20th anniversary of the Wall's fall Monday afternoon. 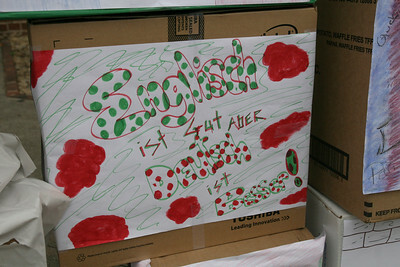 A box's graffiti reads "English is good, but German is better!" 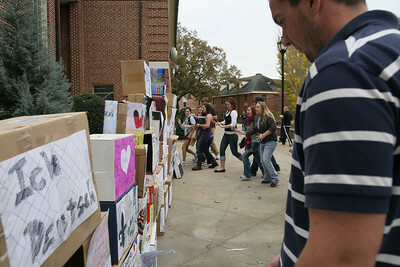 Students of German and French built and subsequently tore down a memorial re-creation of the Berlin Wall under the leadership of Dr. Ute Lahaie Monday afternoon. 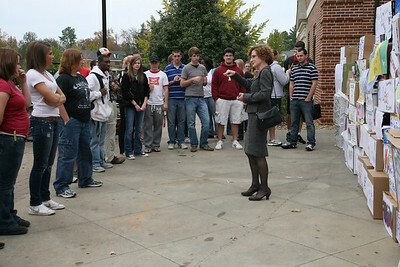 The event, which took place on the Quad behind the DCC, marked the 20th anniversary of the fall of the Wall on November 9, 1989. 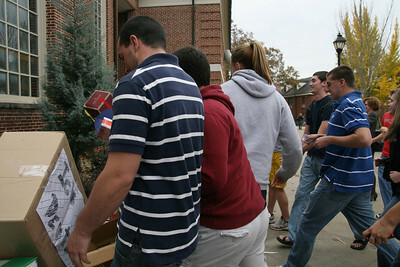 Students examine the various bits of "graffiti" along the faux Berlin Wall commemorating the 20th anniversary of the Wall's fall Monday afternoon. Dr. Ute Lahaie, professor of German, discusses the history of the Berlin Wall just before students attack it to tear it down. 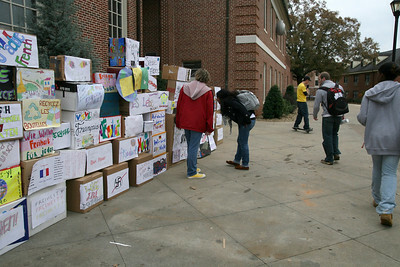 Students of German and French rush the faux Berlin Wall to tear it down in commemoration of the 20th anniversary of the fall of the Wall on November 9, 1989. 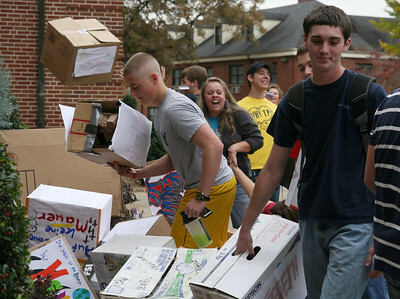 Students of German and French pick through the remains of the faux Berlin Wall after having torn in down in commemoration of the 20th anniversary of the fall of the Wall on November 9, 1989. 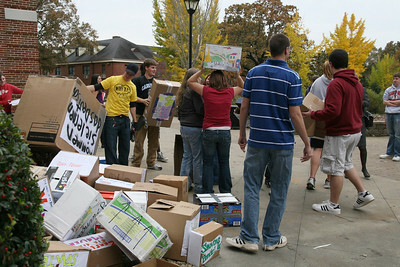 Students of German and French prepare to haul their now demolished "Berlin Wall" to the recycling bins.